Other names: Holly leaved barberry, mountain grape. 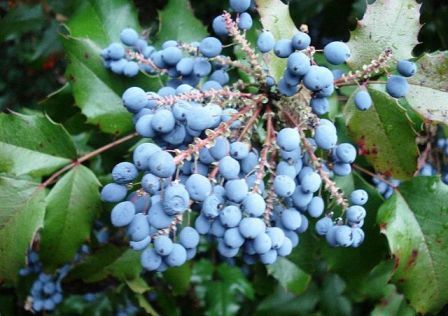 Oregon grape, as the name indicates, is a fruit from America. It grows wild from North American West from Southeast Alaska to Northern California, and eastern Alberta to southern Colorado. It mostly grows in the understory of forests and in brushlands. It is a multipurpose plant bearing small purple fruits which are eaten by local people. 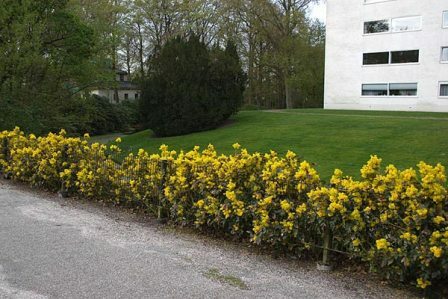 An evergreen shrub, evergreen, 0.3-3 m high; stems usually monomorphic, seldom with short axillary shoots; bark of 2nd-year stems gray-brown or purplish, glabrous; bud scales 4-8 mm, deciduous; spines absent. Leaves 5-9-foliolate; petioles 1-6 cm; leaflet blades thin and flexible or rather rigid; surfaces abaxially glossy, smooth, adaxially glossy, green; terminal leaflet stalked, blade 5.1-8.7(-14.5) × 2.4-4.5(-5.5) cm, 1.7-2.5 times as long as wide; lateral leaflet blades lance-ovate to lance-elliptic, 1(-3)-veined from base, base obtuse or truncate, rarely weakly cordate, margins plane or undulate, toothed, each with 5-21 teeth 0-2 mm tipped with spines to 0.8-2.2 × 0.2-0.3 mm, apex acute or sometimes obtuse or rounded. Inflorescences racemose, dense, 30-60-flowered, 3-9(-11) cm; bracteoles membranous, apex rounded or obtuse, sometimes apiculate; flowers: anther filaments with distal pair of recurved lateral teeth. Fruit a berry, blue, glaucous, oblong-ovoid, 6-10 mm, juicy, solid. 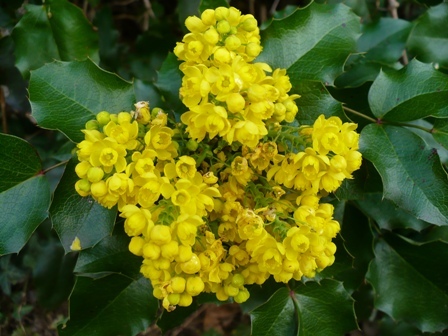 Oregon grape plant is also recommended by herbalists and alternative healers to treat several body ailments. Native Indian tribes used it for treating loss of appetite and debility. It is currently used in the treatment of gastritis and general digestive weakness, to stimulate the kidney and gallbladder function and to reduce catarrhal problems. 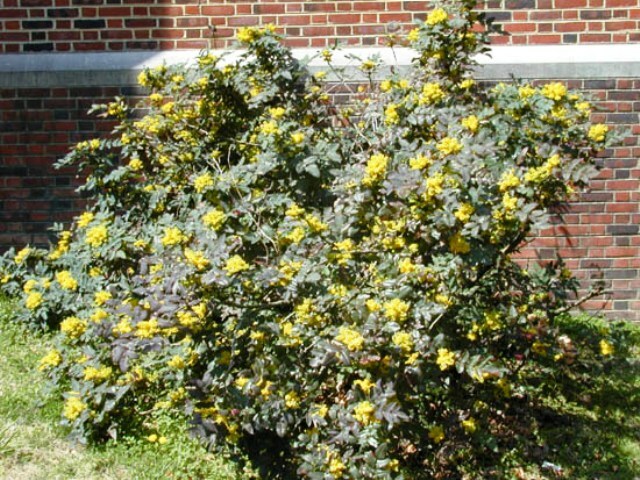 Oregon grape is an excellent shrub for massed planting as hedge or screen or planted singly for color accent. New growth has bronze-red coloring. Purplish-red leaves in winter. Yellow flowers followed by blue berries. New plants are raised from seed as well as from cuttings. Some nurseries also sell their selections claiming these to be superior to the common wild growing plants.